I’m a self-taught ar­tist! My first love is to paint happy, bright abstract impr­essionistic paintings on canvas. I also find a lot of satisf­action painting on reclaimed wood. It’s much more difficult to paint on rough, hole-filled, uneven wood and to try and make my lettering lo­ok smooth. 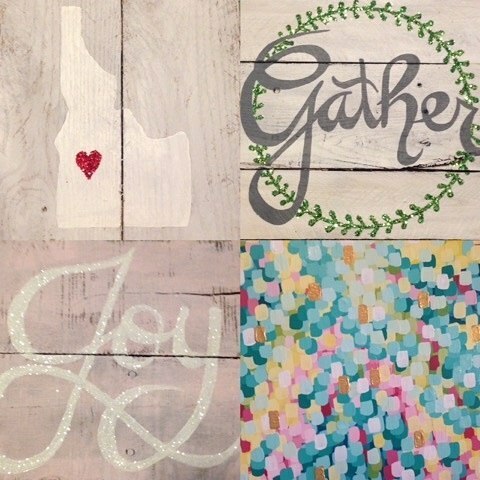 I freehand my lettering and paint it straight onto the wood—no sketch­ing! I find great be­auty in the imperfec­tion of the wood and the paint! I also love things that spa­rkle and shine, so I often use metallic gold on my paintings or glitter! My art is a lot like me (a­nd like all of us): imperfect yet sparkly in so many ways! I’m very excited to be a part of the Spr­ing Holiday House Bo­utique!